The corpses of most people murdered at the Aktion Reinhard(t) extermination camps Bełżec, Sobibór, Treblinka were burned, which means that what is left of most victims are cremation remains like ashes and bone fragments. Holocaust deniers (so-called "Revisionists") Carlo Mattogno, Jürgen Graf and Thomas Kues don’t deny that bodies were burned at these places, but dispute the historically accepted scale of corpse cremation on grounds that it would have been logistically impracticable in what concerns fuel requirements and the duration of cremations and is incompatible with the available evidence, especially the amount of cremation remains found. This series of blogs starts with a presentation of what is known about the cremation devices and methods applied as well as the duration of cremations at each of these three camps. There follows a discussion of the deniers' arguments mentioned in the preceding paragraph. Finally the deniers’ alternative explanations for the undisputed cremation of corpses at these camps are examined. As concerns Bełżec extermination camp the related arguments have been amply debated between Mattogno and me, with Mattogno’s reply to my last submission still outstanding. Although without mentioning my name, the recent Sobibór book by Mattogno, Graf & Kues tries to address some of my arguments in said debate. Being the "Revisionist" coryphées’ latest publication on the subject, this book is deemed to contain the latest status of their arguments and will thus be the main focus in assessing said arguments. Burning of corpses at Bełżec took place as early as August 1942, according to the testimony of Dr. Pfannenstiel. At that time cremation was not yet used as a means of body disposal per se but probably in order to help stretch the available burial space, judging by Dr. Pfannenstiel’s description whereby the corpses burned just partly and fresh corpses were placed on top of them thereafter, perhaps also for reasons of hygiene. Again a short time later I was assigned to the burning detachment; the incineration of the dug-out corpses was a process so abominable humanly, esthetically and in what concerns the smell, that the fantasy of people who today are used to live under civil conditions probably is not sufficient to imagine this horror. The time given by Gley for the start of cremations, November 1942, is corroborated by the testimonies of Polish civilians living near the camp and the depositions of another Bełżec SS-man and of one of the camp’s non-German guards; these witnesses also tend to confirm that cremations ended in March 1943 as stated by Gley. On the other hand, erasing the traces of the camp lasted until June 1943, and a witness noticed the stench of exhumed corpses as late as April of that year, so it is possible that corpses were burned at Bełżec beyond March 1943. Little is known about the construction of the fireplaces mentioned by Gley and the method applied to burn the corpses, though it stands to reason that they resembled the devices and methods applied at the other two camps of Aktion Reinhard(t), Sobibór and Treblinka. According to a Polish investigation report, the corpses had been extracted from the soil with special cranes and burned on heaps doused with an easily flammable substance; later the procedure had been improved by building structures from railway rails on which the corpses were placed alternately with layers of wood drenched in an easily flammable substance. Cremation remains were crushed with a special machine, the description of which suggests a ball mill. 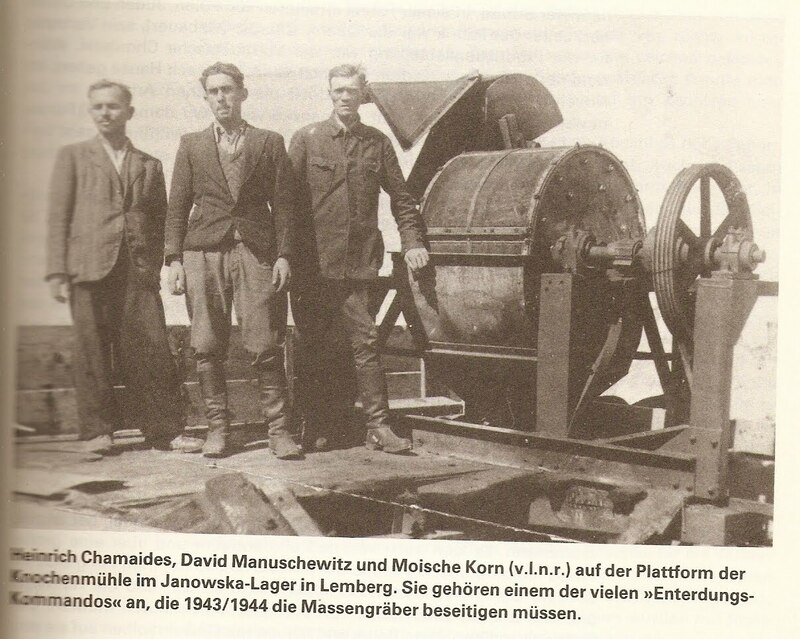 According to O’Neill, this machine was borrowed from Janowska concentration camp and resembled a cement mixer with heavy iron balls inside the revolving drum; as the drum revolved at high speed, the metal balls crushed the bone material into small fragments. If this is accurate, the machine must have looked like the one shown in Image 2.1.1 below. Sobibór was the first of the three camps of Aktion Reinhard(t) to change its body disposal procedure from burial to cremation, the main reason being probably a concern that the camp’s water supply might be polluted by leachate from the graves due to the camp area’s relatively high groundwater level. The corpses of the victims killed after the camp resumed operation in October 1942 following a two-month interruption were taken directly from the gas chambers to places of cremation, while the corpses of the victims killed and buried until the end of July/early August 1942 were disinterred with a mechanical excavator for this purpose. As in the case of Bełżec, little is known about the cremation sites at Sobibór. According to Schelvis, rails were criss-crossed over the top of a pit excavated for this purpose, forming a rudimentary grid. This configuration is also mentioned by survivor eyewitness Leon Feldhendler. SS-Sturmbannführer Streibel, who visited Sobibór in 1942, recalled a roaster made of railway lines, supported by a stone base; he mentioned having seen "the cremation sites", which suggests that there was more than one of them. The Judgment LG Hagen vom 20.12.1966, 11 Ks 1/64 mentions (several) huge grids inside a pit. The latter description is corroborated by the research findings of Prof. Andrzej Kola. Graves nos. 1 and 2 were considered to be body-burning graves, presumably because (unlike graves nos. 3, 4, 5 and 6) they contained only cremation remains but no human remains in wax-fat transformation. The surface area of these graves is respectively 400 m² and 500 m², which means that cremation grids of considerable size could fit into them. The mention of a single pit by eyewitnesses suggests the possibility that graves nos. 1 and 2 are actually part of what was one single grave in camp times, just like graves 3 and 4 and graves 5 and 6 may have been respectively one grave. Prof. Kola’s team also identified a possible smaller location of body-burning activity with an area of 30 m², which is called grave no. 7 in Kola’s report. Few particulars about the body-burning procedure at Sobibór are known because no inmate from the Sobibór extermination sector "Camp III" survived. Witnesses mentioned the pyres being doused with gasoline or another flammable liquid, and huge fires flaring up so high that they could be seen far and wide; Ukrainian guards in their watchtowers found it hard to breathe when the wind blew in their direction from the burning grids. The smell of burned flesh prevailed throughout the camp and its vicinity. The bones that survived cremation were crushed with hammers. While we in Camp I were busy building and beautifying, the work of exhuming and burning the bodies of the first victims of the Warsaw ghetto continued intensively in Camp 2. There were a few tremendously huge mass graves, each one filled with tens of thousands of murdered people. The layers of corpses were covered with chlorine. At the beginning, the chlorine used to arrive in wagonloads. The bodies were now being dug out and burnt in order to erase the evidence. It was not an easy job. For many months, three bulldozers growled away from 4 o'clock in the morning until nightfall. The work went on with great intensity, in two shifts. The bulldozers would constantly dig up earth mixed with body parts. The body parts had to be carefully picked out and taken on wooden carriers to be burnt in the great ovens. It must have been at the beginning of 1943. That’s when excavators were brought in. Using these excavators, the corpses were removed from the huge ditches which had been used until then [for burial]. The old corpses were burned on the roasters, along with the new bodies [of new arrivals to the camp]. During the transition to the new system, Wirth came to Treblinka. As I recall, Wirth spoke of a Standartenführer who had experience in burning corpses. Wirth told me that according to the Standartenführer’s experience, corpses could be burned on a roaster, and it would work marvelously. I know that in the beginning [in Treblinka] they used rails from the trolley to build the cremation grill. But it turned out that these rails were too weak and bent in the heat. They were replaced with real railroad rails. The area of the grid can be roughly estimated on hand of the above-quoted data, my estimate being ca. 66 square meters. The volume of space available underneath the grid, considering the calculations in the previous paragraph, would be about 66 x 1.70 = 112 cubic meters. At that time SS Oberscharführer or Hauptscharführer [Herbert] Floss, who, as I assume, was previously in another extermination camp, arrived. He was in charge of the arrangements for cremating the corpses. The cremation took place in such a way that railway lines and concrete blocks were placed together. The corpses were piled on these rails. Brushwood was put under the rails. The wood was doused with petrol. In that way not only the newly accumulated corpses were cremated, but also those taken out from the graves. The SS "expert" on body burning ordered us to put women, particularly fat women, on the first layer of the grill, face down. The second layer could consist of whatever was brought – men, women, or children – and so on, layer on top of layer … Then the "expert" ordered us to lay dry branches under the grill and to light them. Within a few minutes the fire would take so it was difficult to approach the crematorium from as far as 50 meters away. It was genuine hell. From a distance it looked like a volcanic eruption boiling up through the earth’s surface and spreading flames and lava. Everything around was caught up in the noise and turmoil. At night the smoke, fire, and heat were unbearable. About the number of cremation grids in operation at Treblinka there are no precise data. Arad mentions that at the height of cremation operations the number of cremation sites was increased to six and the roasters "occupied a good portion of the area east of the gas chambers, which was clear of mass graves and buildings" . Yet according to the judgment at the 1st Düsseldorf Treblinka trial, the number of cremation roasters could not be established exactly in the main proceedings. After the bodies had been burned, the prisoners belonging to the "working crews" passed the ashes and remains of the bodies through a sieve. The parts of the body that had burned but had preserved their natural shape were put into a special mortar and pounded into flour. This was done in order to hide the traces of the crimes committed. Later on the ashes were buried in deep pits. Arad wrote that round wooden sticks were used to break the remaining bones into small fragments, which were then run through a tightly woven screen made of metal wire; those bone fragments which did not pass through the screen were then returned for further smashing. Unburned bones which proved too difficult to fragment were returned to the roaster and re-ignited with a new pile of bodies. What Arad calls "round wooden sticks" are likely to have been not sticks but wooden logs similar to those portrayed in the drawing from Auschwitz-Birkenau by David Olère shown in Image 2.3.1. In another article by Arad, these objects are more correctly referred to as Holzpflöcke, i.e. wooden logs. The ash and bits of bone left after cremation and crushing were returned to the mass graves that had previously held the bodies, where they were scattered in several layers, interspersed with layers of sand, and covered by a top layer of earth 2 meters thick. Some of the cremation remains were taken away from the camp area, as is mentioned in the Soviet investigation report about Treblinka I and Treblinka II dated August 24, 1944. After the Soviet army overran the camp area these remains were largely brought to the surface by robbery diggers searching for valuables supposedly buried with the victims, which included Red Army troops using explosives. As becomes apparent from contemporary investigation reports and photographs, these activities unearthed not only ashes and bone fragments but also larger human remains such as bones (sometimes still with tissue on them) and skulls. This shows that the results of the exhumation, burning and crushing procedure were not nearly as complete as certain descriptions suggest. These authors’ books about Bełżec, Sobibór and Treblinka are identified in note 2 of the blog Mattogno, Graf & Kues on the Aktion Reinhard(t) Mass Graves (1), and will be referred to hereinafter as, respectively, "Mattogno, Bełżec", "MGK, Sobibór" and "M&G, Treblinka". See the blog series collected under the link Carlo Mattogno on Belzec Archaeological Research. See the blog Mattogno, Graf & Kues on the Aktion Reinhard(t) Mass Graves (3). Robin O’Neill, Belzec: Stepping Stone to Genocide; Hitler's answer to the Jewish Question (hereinafter "O’Neill, Bełżec"), chapter 15: "Chloride of lime was spread over the six still open mass graves identified above in an effort to avoid epidemics breaking out. Evidence of the subsequent failed attempt at cremating corpses in graves may be found in the small graves near the north fence-- 27, 28 and 32-- in each of which a layer of burnt human remains and pieces of carbonized wood were found." Deposition of Heinrich Gley in Munich on 07.01.1963, BAL (Bundesarchiv Zweigstelle Ludwigsburg, German Federal Archives Ludwigsburg Branch Office) B162/208 AR-Z 252/59, Bd. IX, fl. 1697 ff. Digital copies of these pages are included in Jules Schelvis’ research files published as PDF by the Dutch archives, hereinafter referred to as "Schelvis files", in this case Schelvis file 47, pp. 293 ff. (pagination refers to the PDF view). Gley’s estimate of the number of bodies cremated must be considered too high in light of the Höfle Report, whereby the total number of Jews deported to Bełżec was 434,508. Eugeniusz Goch, in his deposition before examining judge Godziszewski in Zamość on 14.10.1945 (translation from Polish to German in BAL B162/208 AR-Z 252/59, Bd. I, fl. 1134-36 - Schelvis file 8, pp. 111-13), stated that the corpses were burned at the end of 1942 and the beginning of 1943, and mentioned having seen three heaps burning simultaneously. The same time span was given by Stefan Kirsz, who in his deposition before examining judge Godziszewski in Zamość on 15.10.1945 (translation from Polish to German as above, fl. 1147-49 - Schelvis file 8, pp. 115-17) also mentioned several fires at once. According to Eustachy Ukraiński’s deposition before examining judge Godziszewski in Zamość on 11.10.1945 (translation from Polish to German in BAL B162/208 AR-Z 252/59, Bd. VI, fl. 1117-20 – Schelvis file 8, pp. 121-24), corpses were burned starting December 1942 and throughout the spring of 1943, with several fires burning at the same time. Stanislaw Kozak, questioned by Godziszewski on 14.10.1945 (translation from Polish to German as above, fl. 1129-33 - Schelvis file 8, pp. 137-41), recalled two to three fireplaces and that the burning had started in late autumn 1942 and lasted for three months without interruption. In his deposition in Munich on 18.12.1963 (BAL B162/208 AR-Z 252/59, Bd. VIII, fl. 1831 ff - Schelvis file 49, pp. 313 ff. ), former Bełżec SS-man Fritz Tauscher stated that upon his arrival in Bełżec at the end of October 1942 camp commandant Hering had put him in charge of exhuming the corpses from the mass graves and burning them. He had gone to work immediately, and the corpses had thereupon been burned day and night without interruption, first at one and then at two fireplaces, until March 1943. Tauscher mentioned that some transports had arrived while the burning operation was going on and the corpses of their occupants had been burned together with the exhumed corpses. Deposition of Aleksandr Illarionovich Semigodov in Penza, RSFSR-USSR on 24.05.1973, translation from Russian to German in BAL B162/208 AR-Z 643/71, Bd. IV, fl. 704-11 (Schelvis file 22, pp. 110 ff.) The witness stated that the corpses extracted from the mass graves had been burned starting at about the end of autumn 1942, together with the corpses of newly gassed deportees. At the time Semigodov had left Bełżec in March 1943, according to this deposition, the extermination and burning had still been under way (fl. 709). Gerald Reitlinger, The Final Solution. The Attempt To Exterminate The Jews Of Europe, 1939-1945 (hereinafter "Reitlinger, Final Solution"), 2nd revised edition, 1968 Thomas Yoseloff, Cranbury, New Jersey, p. 148: " In April, 1943, a Jewish doctor, who later escaped to Switzerland, noticed the appalling stench of the exhumed bodies as he passed the spot by train." According to Eustachy Ukraiński (as note 6), cremation lasted throughout the spring of 1943. Report about investigation results in the Bełżec extermination camp case, signed by state attorney Witkowski, German translation from Polish in BAL B162/208 AR-Z 252/59, Bd. VI, fl. 1185-88 (Schelvis file 8, pp. 143-46). The report refers to several witnesses including Eustachy Ukraiński, Tadeusz Misiewicz, Stanislaw Kozak and Kazimierz Czerniak. The machine(s) extracting the corpses were mentioned by witnesses Goch, Kirsz, Ukraiński and Kozak (depositions as note 6); Kirsz and Kozak mentioned the pyres being doused with a liquid, while Ukraiński stated that the fires had constantly been "fueled with a certain powder" ("mit einem bestimmten Pulver verstärkt", in the deposition’s German translation, as note 6, fl. 1119). A ball mill is a cylindrical device used in grinding (or mixing) materials like ores, chemicals, ceramic raw materials and paints. Ball mills rotate around a horizontal axis, partially filled with the material to be ground plus the grinding medium. Different materials are used as media, including ceramic balls, flint pebbles and stainless steel balls. An internal cascading effect reduces the material to a fine powder. O’Neill, Bełżec, Chapter 10. O’Neill mentions that the machine was operated by a Janowska inmate, an Hungarian Jew named Szpilke; this was obviously the same Szpilke, or Szpilka, who told Bełżec survivor Rudolf Reder about having set up and operated this machine, as mentioned by Reder in his report about Bełżec (German translation in BAL B162/208 AR-Z 252/59, Bd. II, fl. 258 ff. - Schelvis file 8, pp. 60 ff., mention of Szpilke on fl. 286/287) and in his deposition before examining judge Jan Sehn in Krakow on 29 December 1945 (German translation in BAL B162/208 AR-Z 252/59, Bd. I, fl. 1175 ff. – Schelvis file 8, pp. 90 ff. ; mention of Reder’s acquaintance Scharf – Szpilka on fl. 1180). 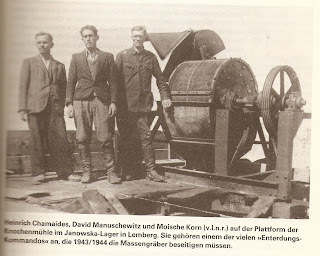 The machine used at Janowska concentration camp is mentioned in the testimonies before the Lemberg Deputy District Attorney of Heinrich Chamaides on 21.9.1944 and of Moische Korn on 13.9.1944, quoted in the document collection »Gott mit uns« Der deutsche Vernichtungskrieg im Osten 1939 – 1945, edited by Ernst Klee and Willi Dreßen, 1989 S. Fischer Verlag GmbH, Frankfurt am Main, pp. 226 ff. The photo in Image 2.1.1 is shown on page 225 of the same collection. See the blog Mattogno, Graf & Kues on the Aktion Reinhard(t) Mass Graves (4). Yitzhak Arad, Belzec, Sobibor, Treblinka. The Operation Reinhard Death Camps, Indiana University Press, Bloomington and Indianapolis 1987 (hereinafter "Arad, Reinhard"), p. 177; Jules Schelvis, Sobibor: A History Of A Nazi Death Camp, 2007 by Oxford International Publishers Ltd. in association with the United Stated Holocaust Memorial Museum (hereinafter "Schelvis 2007"), pages 111f. "Die schon verwesten Leichen wurden mit Hilfe des Baggers aus den Gruben gehoben und auf grossen Rosten in einer bereits ausgeschachteten, aber noch leeren Grube verbrannt." ("The already decomposed corpses were extracted from the pits with the excavator’s help and burned on huge grids in an already dug, but still empty pit.") – Judgment LG Hagen v. 20.12.1966, 11 Ks 1/64, Justiz und NS-Verbrechen Band XXV, Lfd. Nr 642, partial translation available online. Former SS-man Erich Bauer mentioned that the corpses were burned in pits on grids made of railway rails ("In den Gruben wurden die Leichen auf Rosten, die aus Eisenbahnschienen hergestellt waren, verbrannt. "), see Bauer’s deposition in Berlin on 10.12.1962, BAL B162/208 AR-Z 251/59, Bd. VIII, fl. 1663 ff. (fl. 1669) – Schelvis file 46, pp. 52 ff. (p. 59). A deep pit containing burning grids was mentioned by survivor witness Chaim Engel, see Engel’s deposition before the Information Bureau for Jews in Westerbork, Netherlands, BAL B162/208 AR-Z 251/59, Bd. V, fl. 889-92 (fl. 890) – Schelvis file 14, pp. 161-164. Survivor eyewitness Kurt Thomas mentioned what was translated as a "Krematoriumsschacht" (crematorium shaft) or "Verbrennungsschacht" (burning shaft) in the German translation of his letter to the World Jewish Congress dd. 3.12.1961 (as above fl. 1024 ff., namely fl. 1027, 1036 and 1043-44 – Schelvis file 20, pp. 63 ff., namely pp. 66, 75 and 82-83). In his letter to the Dutch Red Cross dd. 3.9.1946, written under the name Kurt Ticho, the witness mentioned a "Kremationsgrube", i.e. a cremation pit (Schelvis file 20, pp. 91 ff., p. 95). Jan Piwonski, turnout setter at Sobibór train station, learned about the burning of corpses in a pit from a non-German camp guard named Waska, according to his deposition in Lublin on 10.5.1984 (Dortmund Public Prosecutor’s Office file StA. Do Sob 85 PM III NO 99, pp. 8/9 of the interrogation protocol, Schelvis file 22, pp. 81 ff., pp. 88-89). Kola, Andrzej, "I Badania archeologiczne terenu byłego obozu zagłady Żydów w Sobiborze w 2001 r" ("1st Archaeological Research of the Former Jew Extermination Camp at Sobibor in 2001", hereinafter "Kola, Sobibór"), in: Przeszłość i Pamięć. Biuletyn Rady Ochrony Pamięci Walk i Męczeństwa Nr. 4 (21) z 2001 r, pages 115 to 123; descriptions of mass graves on pages 116/117. Translated into English by Katarzyna Piotrowska. The translation is available in the thread 1st Archaeological Research of the Former Jew Extermination Camp at Sobibór in 2001. See also the blog Mattogno, Graf & Kues on the Aktion Reinhard(t) Mass Graves (1), section 2.2. See aforementioned blog, Table 2.2.1. Report of Berisch Freiberg (inmate) taken down by Bluma Wasser in Łódź on 25.7.1945, translation from Yiddish to German in Dortmund Public Prosecutor’s Office file StA.Do. Js2//61 Aktenband VIII, fl. 2630-79 (fl. 2638) – Schelvis file 15, pp. 22 ff., p. 30; deposition of Jan Krzowski (inhabitant of Wlodawa) in Lublin on 07.08.1974, translation from Polish to German in BAL B162/208 AR-Z 643/71, Bd. III, fl. 704-11, fl. 410 ff. (fl. 413-14) – Schelvis file 21, pp. 98-106 (pp. 101-02); deposition of Bronislaw Lobejko (railway worker) in Olesnica on 08.01.1946, translation from Polish to German in Dortmund Public Prosecutor’s Office file StA. Do Sob 85 PM IV NO 178, pp. 2-3 of the interrogation protocol – Schelvis file 22, pp. 8-9 (the witness mentioned having smelled burning petroleum); deposition of Jan Piwonski in Lublin on 10.5.1984, as note 19. Schelvis 2007, p. 112, referring to the testimonies of Ukrainian guard Daniltsjenko (deposition on 25 January 1985 in Lisakowsk, Kazakh SSR, StA Do Sob 85 PM V NO 96, pp. 7-8 of the interrogation protocol - Schelvis file 21, pp. 34 ff., pp. 40-41) and Polish villager Piwonski (deposition in Lublin on 29 April 1975, BAL B162/208 AR-Z 643/71, Bd. IV, fl. 441-452, fl. 443-44 - Schelvis file 21, pp. 65-76, pp.67-68). Abraham Krzepicki, "Eighteen Days in Treblinka", in: Donat, Alexander, The Death Camp Treblinka. A Documentary, New York 1979 (hereinafter "Donat, Treblinka"), pp. 77-144, here page 92; Weinstein, Eddi, Steel Quenched in Cold Water, The Story of an Escape from Treblinka, Yad Vashem, Jerusalem 2001, online excerpt; deposition of Samuel Rajzman on 26.09.1944, quoted in M&G, Treblinka, p. 141f. Rajzman’s mention of pyres suggests otherwise, but it is possible that he mixed up the burning he witnessed upon arriving at the camp with the later wholesale cremation in his recollection. Cymlich, Israel and Strawczynski, Oskar, Escaping Hell in Treblinka. Yad Vashem and the Holocaust Survivors’ Memoirs Project: New York, 2007 (hereinafter "Escaping Hell"), pp. 129 ff. ; Glazar, Richard, Trap With A Green Fence, Northwestern University Press, Evanston, IL, 1995, p. 29 f.; Mendel Korytnicki (23.09.1944, GARF f.7445, op.2, d.134, l.57ob), quoted in Sergey Romanov, The Clueless Duo and early corpse incineration in Treblinka and Bełżec. The Wehrmacht commandant’s complaint is documented in the War Diary of the Oberquartiermeister, Mbfh Polen, 1.5..41-31.12.43, in National Archives, T-501/219/461 ("OK Ostrow meldet, dass die Juden in Treblinka nicht ausreichend beerdigt seien und infolgedessen ein unerträglicher Kadavergeruch die Luft verpestet." – "OK [local commandant] Ostrow reports that the Jews in Treblinka are not adequately buried and as a result an unbearable smell of cadavers pollutes the air. "), quoted in Christopher Browning, Evidence for the Implementation of the Final Solution, expert report submitted for the defense in the Irving-Lipstadt lawsuit, electronic edition. Regarding the connection between this complaint and the start of systematic corpse exhumation and cremation see Jens Hoffmann, "Das kann man nicht erzählen": "Aktion 1005" - Wie die Nazis die Spuren ihrer Massenmorde in Osteuropa beseitigten (hereinafter "Hoffmann, Aktion 1005"), 2008 Konkret Literatur Verlag, Hamburg, p. 234. Arad, Reinhard, pp. 173; see also the discussion by Romanov, as previous note. Quoted in Arad, Reinhard, p. 174. LG Düsseldorf vom 22.12.1970, 8 Ks 1/69, published in Justiz und NS-Verbrechen, Band XXXIV, Lfd.Nr.746. Deposition of former Ukrainian guard Pavel Vladimirovich Leleko on 20.02.1945, English translation online. LG Düsseldorf vom 3.9.1965, 8 I Ks 2/64, published in Justiz und NS-Verbrechen, Band XXII, Lfd.Nr.596. See the blog Incinerating corpses on a grid is a rather inefficient method …, section 1. Size and configuration of the roaster. Measurements of various types of flat bottom rails are given in the ThyssenKrupp Gft Gleistechnik table Vignolschienen. My estimate of 65.625 ≈ 66 m² is a comparatively conservative one. Mattogno & Graf assume an area of 90 m² (M&G, Treblinka, p. 148). Arad, Reinhard, pp. 174-75, quoting SS-Oberscharführer Heinrich Matthes and survivor eyewitnesses Yechiel Reichman and Jacob Wiernik. Leleko’s deposition on 21.02.1945, English translation under online. Image published in Jean-Claude Pressac, AUSCHWITZ: Technique and Operation of the Gas Chambers, p. 390. Arad, "Die »Aktion Reinhard«: Gaskammern in Ostpolen", in: Kogon, Langbein, Rückerl et al, Nationalsozialistische Massentötungen durch Giftgas, 1986 Fischer Taschenbuch Verlag GmbH Frankfurt am Main (hereinafter "Kogon et al, Massentötungen"), pp. 146 to 193, here page 189. Translated excerpt in M&G, Treblinka, pp. 78 f. The source given is GARF (Gosudarstvenni Archiv Rossiiskoi Federatsii - State Archive of the Russian Federation, Moscow), 7021-115-9, pp. 103-110. See the blogs Mattogno, Graf & Kues on the Aktion Reinhard(t) Mass Graves (1), section 2.3, and Mattogno, Graf & Kues on the Aktion Reinhard(t) Mass Graves (2), section 3.2. The presence of larger human remains may be explained by insufficient burning/crushing and/or by the incomplete emptying of the burial pits mentioned by Oscar Strawczyinski (Escaping Hell, p. 169, quoted in Mattogno, Graf & Kues on the Aktion Reinhard(t) Mass Graves (1), section 2.1).